I went old school and took the summer off from writing as if I were a high school student. At least that is the reason I was going to give all of you but the truth is I was so daunted by how many blogs are out there I wondered why should they read mine? Then my husband brought me to Las Vegas to celebrate my birthday. We are staying in Vegas for a couple of weeks and of course our beloved dog pack is with us. While here I thought it would be nice to meet the organizer of a dog group and her members. Something happened during this session that made me realize that I need to get back to writing. What happened? September in Las Vegas is still very warm so a dog meet up for French Bulldogs has to start very early before it becomes too hot for them to play outdoors. We met up at 8 am and had a wonderful meetup. Lot’s of French Bulldogs and wonderful owners. Everyone was so friendly like their dogs. Then came “THE expert”. If you have gone to dog parks or dog friendly areas you have met “THE expert”. 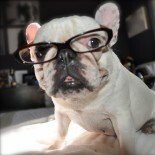 It’s a person who assumes that they have the most dog knowledge and makes sure everyone else knows they know it too. She came barreling in with her ego bouncing off of her like meteor entering our orbit. I was the first recipient of her attention. My dog Mimolette has trouble breathing when she is very active. She has an elongated palate, at least that is the assumption because a vet can not diagnose this unless the dog is put under sedation. I have waited to have the surgery so that I can have her spayed at the same time. In the meantime I regulate her physical activity so it doesn’t get to a dangerous level. THE expert had arrived just as I was cooling Mimolette off and getting her to settle down so that her breathing could return to normal. THE expert bullied her way over, commanded me to hold my dog still while she poured water all over her. She says, “this dog has an elongated palate and she’s over heating”. Really Sherlock?? I would have never known, thank God you showed up and saved the day. As I was saying, “yes I know this”, another member stepped up and said, this is Angela she runs the San Diego French Bulldog Group. But THE expert was on a roll and just kept talking. I walked away with Mimolette and ignored her for the rest of the morning. It turns out THE expert had shown up with the intention of teaching EVERYONE at this group how to cool down their dogs. She had brought along with her several gallons of water and kept telling people to hold their dogs so she could cool them off. I observed but said nothing, it’s not my group and they weren’t my dogs. She kept telling everyone about all the French Bulldogs she owns and breeds so she knows them well. She lives in an apartment and owns 8 dogs and has two litters right now, with plans for more in the very near future. Now I never had a one on one conversation with her, this was just what she kept rattling off, because in her mind the number of dogs equals to the extent of her knowledge. I did observe though that the 3 month old pup she had brought with her was as much a bully as she was and her idea of correcting the puppy was picking it up and giving it a “time out”. Because a dog understands the concept of time out. SERIOUSLY. 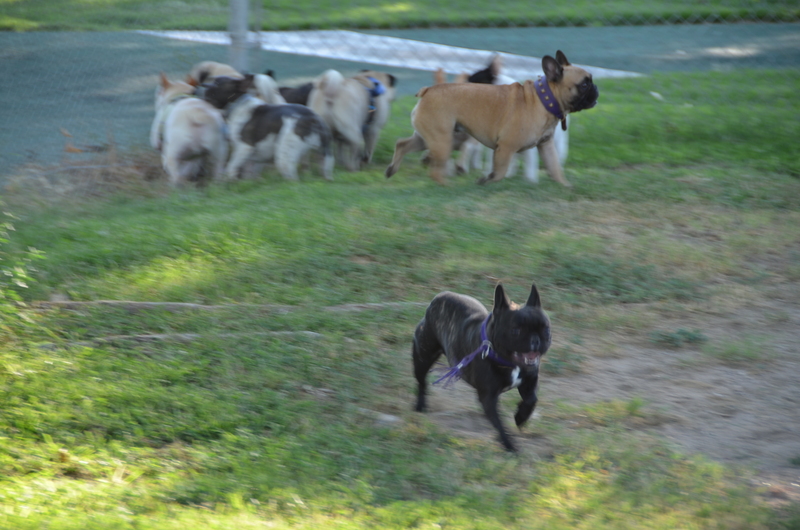 There was an older Frenchie there, named Shiloh, he had trouble walking. To me he looked just like a Koala when he would waddle away. He was absolutely adorable and perfect, just needed a little extra time to get where he was going. THE expert decided this little cutie pie needed to be cooled down. I never spoke to Shiloh’s owner to find out why he had difficulty walking, but I would NEVER grab this guy because you have no idea if he is in pain or not. THE expert grabbed him by the fur on his spinal area to get him to stand still so she could douse him with water. Shiloh freaked out, he pulled away and straight up came at her teeth barred and snarling. Her “expert” response to this was to antogonize him further by coming at him yelling at him and saying “oh yeah oh yeah come get me”. She thought this was hysterical and then she poured water all over the little guy, head and all. He was growling and snapping and was the opposite of his demeanor the entire morning. I walked over and got low and called him to me. He calmed down and came to me and I pet him under his chin and just spoke softly to him and got him to relax. He gave me kisses and felt secure that I wouldn’t let her get to him again. THE expert just went on to her next victim. I do not see how aggravting a dog will help “cool him down” but then I haven’t bred dogs so I guess I am not an “expert”. What’s the point to this whole story? What I realized throughout all of this is that we are too nice to self proclaimed experts. She came in there stating who she was and no one questioned her. Then everyone is too polite to say HEY don’t touch my dog, including me. After we left and went home I was super angry at THE expert until I realized I was actually really angry at myself. She is the idiot she has chosen to be, that does not mean that I have to go along with her. I have my own voice and I am my dog’s advocate and I should have stood up to her and told her to take her crazy elsewhere. She is the dog park bully. Normally we go to dog parks and worry about an ill behaved animal, but we should be on the lookout for the badly behaved owners more than the dogs. I was told a story recently by a wonderful young couple that adopted a puppy from us about how they lost their beloved pit bull. He was one of those pit bulls that stand out physically and he was a real sweetheart, just the best dog ever. Then an “expert” interacted with their dog at the beach, decided the dog was being aggressive even though he started it by deciding as he pet the dog he should have a choke hold on the animal. This escalated into an attack by his rottweiler and eventually him trying to drown the pit bull in the water. The whole time he kept saying how he was teaching the dog not to behave badly, he has experience. The young couple being proper and not wanting to hurt THE expert’s feelings only held back his dog and kept asking him to let go of their animal. The pit bull was rushed to the vet, physically he recovered, mentally he never did. He became a violent dog that not even his owners could control. They made the very hard decision to put him down. We are our dog’s advocates. I do not like to treat a dog like a human child, but in this case I think we need to step up and realize that if a stranger put their hands on our children we would react quickly and with strength, so must we with our pets. Our dogs depend on us to keep them safe and when we take them to a public arena such as a dog park, they assume that we have their backs and that it’s a fun place. When that safe, fun place turns into a hurtful place, they can lose faith in us to protect them. Whether another dog is being inappropriate with your pride and joy, or a human is, do not think twice about speaking up. Use your body to block them from continuing to touch your dog and ask them to leave the animal alone. We can use a commanding voice without being rude or obscene and to make them know that it is NOT ok to “help” your dog. We ended up leaving the meet up early to avoid further confrontation with THE expert, but I heard drama continued after we left and guess who was in the middle of it all. Yup, THE expert had a confrontation with someone outside the group and it became ugly. I am so glad we had left. This entry was posted on September 17, 2013 by aadubadu in Behavior, Dogs, Editorial, Las Vegas, Puppies and tagged bully, dangerous level, dogpark, french bulldogs, heat, https://fidosense.files.wordpress.com/2013/09/dsc_2146.jpg, trouble breathing.